Pluto's icy surface shows an astonishing variety of landscapes and evidence of active geological processes, according to scientists studying images and data from NASA's New Horizons spacecraft, which flew by Pluto on July 14, 2015. Features observed on the dwarf planet's surface include glaciers of frozen nitrogen feeding into a vast basin, huge mountains of ice, strange pits and ridges, tectonic fractures, and possible ice volcanoes. 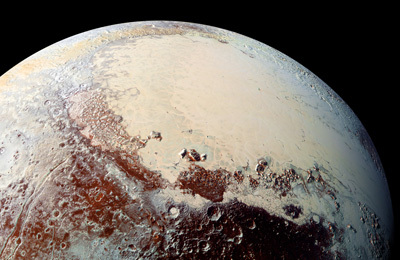 "Pluto is much more geologically active than anybody predicted," said Francis Nimmo, professor of Earth and planetary sciences at UC Santa Cruz and a member of the New Horizons Science Team. "It's like Earth in that the surface is getting reshaped by erosion and other processes. It's harder to tell what's going on in the deep interior, but certainly its surface is extremely active." Nimmo is a coauthor of two papers on Pluto and its moons published March 18 in Science. Observations of Pluto and its largest moon Charon are presented in a paper led by first author Jeffrey Moore of NASA Ames Research Center. Nimmo said he is especially interested in the possibility that Pluto might have an ocean beneath its frozen surface. "That's one of the most important questions we'd like to answer," he said. The first clue suggesting a subsurface ocean is Pluto's shape. Most fast-spinning bodies, including the Earth, have a bulge around the equator due to rotational forces. The bulge tends to form early, when a planet or moon is still relatively warm and pliable. In some cases, like the Earth's Moon, this early large bulge became frozen in place. But Pluto is almost perfectly spherical. "We looked for a bulge, and we don't see one, so Pluto has probably remained relatively warm and relatively weak," Nimmo said. "If it has an ocean inside, that's one way to explain why it can't hold on to a big bulge." Pluto also has a lot of fractures on its frozen surface that appear young and may indicate recent expansion. Because water expands as it freezes, a subsurface ocean in the process of refreezing as the planet cools would cause surface extension and fractures in the ice shell. "What happens is heat builds up in the interior due to radioactive decay in the rocks, which melts the overlying ice to create a subsurface ocean. Over time, the amount of heat decreases, and eventually the ocean begins to refreeze," Nimmo explained. "We would really like to know if that's the case on Pluto, and there are at least hints of it now." One of the dominant features in the New Horizons images of Pluto is a large oval basin, about 1,000 kilometers across, containing a thick layer of volatile ices--mostly frozen nitrogen, as well as carbon dioxide and methane. At a few locations along the edge of the basin (called Sputnik Planum), there are glaciers flowing out of mountainous terrain down into the basin. "You can actually see flow lines and other features you'd see if you looked at a glacier on Earth from the air," Nimmo said. Unlike on Earth, however, the mountains are made of water ice and the glaciers are frozen nitrogen. The nitrogen and other volatile ices may be cycling between Sputnik Planum and the surrounding uplands. Pits in the surface of the plain in some areas may have formed through sublimation of nitrogen ice. "They're peculiar looking features, and we don't really know what's causing them, but it may be energy from the sun causing the nitrogen to sublime away, and once a pit forms it focuses the sunlight and gets larger," Nimmo said. In other parts of the basin, the surface is broken into a pattern of polygonal cells that suggest heat-driven circulation patterns in the depths of the basin. "The nitrogen is solid, but it's soft enough to flow, and it really looks as if it's being stirred by convection driven by heat coming out from the interior," Nimmo said. South of Sputnik Planum, two large mounds with central depressions are suggestive of cryovolcanism, or ice volcanoes. Although he is skeptical, Nimmo said this would be a big deal if it were true. The features are moderately young, so if they are ice volcanoes it suggests the interior of Pluto, not just its surface, must have been active relatively recently. "This is likely to be an issue which is much-debated over the next few years," he said.